A.K.A the Pirates’ Perch, the term Crow’s Nest comes from the lookout station built onto the middle to upper portion of the main mast of a ship. However the term has come to mean a small, raised, auxillary perch used for just about anything from spying, hiding, or looking out. In treehousing, crow’s nests can be especially good for accessing vistas only available from higher up in the tree. The main platform can be set at a lower, more accessible height, and a ladder or netting system can aid the climber in making the final ascent. Of course, it’s also a killer place to operate a water cannon, but the ambusher will want to make arrangements to protect the water supply to avoid being declared under seige. These pictures are examples of crow’s nests built on one, two, or three tree trunks. 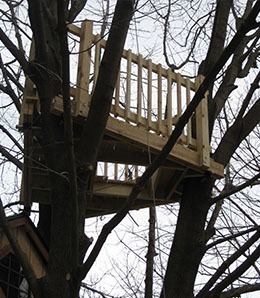 We can find a way to attach a platform high up in most large trees, especially since the crow’s nest is typically small and located close to the center of the tree. The first Crow’s Nests were simply barrels lashed onto the mast of the ship, but we take our typical precautions not to girdle the tree as we build. We use a combination of fixed support points, knee braces, and cables depending on the specific lean of the tree, orientation of leaders, and preferred access point from below. It usually makes sense to figure out the precise details of the layout on location when we can climb around all sides of the tree and tweak the design as we build it. 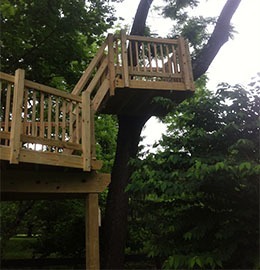 The Crow’s Nest adds another destination and more complexity to a treehouse project.